I spoke with Monocle 24’s The Daily on Monday night about the political and military situation in Syria, starting with President Assad’s latest interview with European media. 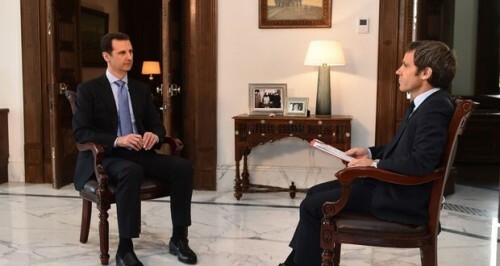 *Assad repeats his propaganda from “no barrel bombs” to “no chemical weapons” to “Syrians love me as their President” — and the Palace atmosphere that helps him believe it. What Assad is trying to win a race against time. Before he reaches a breaking point, economically and on the battlefield, he is trying to get Western governments to say he should stay in power because of the fear of the “extremists” and the “terrorists” who would replace him. It is a strange environment in the Palace. Assad is an avid consumer of the Internet, so he will know about these reports of barrel bombs, of his military carrying out mass killings, of his forces suffering defeats. But then he will give himself this idea that this is all just propaganda, that this is all part of a conspiracy against him. By doing that, he is able to distance himself from reality.